With Wi-Fi connections it’s become so easy to get your data fly through the air with the greatest of ease. Don’t you love Wi-Fi access to the Internet? How convenient it has become to stay in touch while you are traveling and best part is that you can paint your computer screen with web pages and simultaneously you can enjoy the taste of Tazo Chai at Starbucks cafes or even at airport lounges your computer can catch flying data through air. Lets begin with the introduction to Wi-Fi. Wi-Fi stands for wireless fidelity; this is the universal standard that allows all the different kinds of computers out there to interface with a wireless network. Wireless networks consist of wireless devices equipped with wireless cards using radio frequency to transmit data from one location to another. These wireless network cards have unique MAC addresses, which are formatted similar to the standard Ethernet addresses. Here I will give brief introduction of MAC addresses, short for Media Access Control address; this is the hardware address that uniquely identifies each node of network. Apart from wireless devices like laptops, or special Wi-Fi telephone handsets, Wi-Fi networks also comprise of access points (Aps). Aps are base stations that communicate by radio and by wire with both mobile system and the networks that ultimately provides access point to Internet. Each AP can send and receive signals within a limited range, typically 20 to 50 meters inside a building. You can extend the range of a wireless network by using a wireless relay extension point or you can use multiple access point. 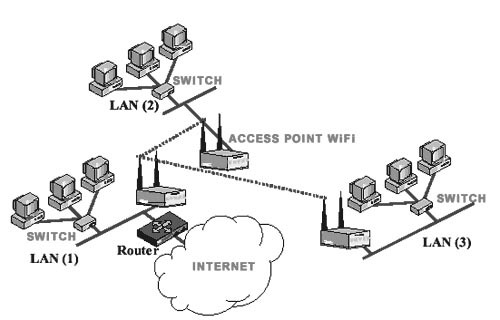 In order to access very far from central location you can join multiple access point. The speed of a wireless network also depends on its access point and the number of computers that can be attach to the access point depends on the manufacturer of the access point. Some access point can handle ten computers, while others can handle over a hundred computers. Now days most of the laptops are Wi-Fi compatible that is the wireless network card that comes with the device will work at any wireless access point. That can be wireless router that you have at home or work or the mobile “hotspot” at the coffee shop or other commercial or public outlets. Ensuring reliability by making certain that service is not disrupted by poor quality radio transmission. Maintaining performance by avoiding slow link speeds and overlong delays. Designing access point networks that can completely blanket the coverage area. Providing security against unauthorized users. The main reason of all the problem faced by Wi-Fi network is that the technology relies on radio transmission which has get its own drawbacks as the signal received by client can be degraded either by distance or the multipath distortion by reflecting off walls and building structures, or degradation can be due to interferences and noise effect. No users want strangers to monitor their e-mail exchanges or gain unauthorized access to their system or any other data. Further security issue is of more concern when you are sending your data through open air that is through Wi-Fi network. Every time you log on to a public Wi-Fi access point, you are transmitting your login name and password over open airwaves, and often a credit card number as well, and anybody can capture mountains of such data. Change default Administrator username and password. Change the default SSID, which is the network name, used by access points and routers and shipped by manufacturer with the product. Do not auto connect to open Wi-Fi networks. Position the router or access point safely. Turn off the network during extended periods of non-use. With the development of smart Wi-Fi techniques, wireless networks are beginning to behave more like their wired counterparts, and wireless users can notice the difference. More remain to be done in this regard especially in the area related to security. Research and development in this area is continuing and in the coming future we will get more secure and mature Wi-Fi networks.